I’m a big fan of getting business cards printed three up on a 4×6 print from Sam’s Club. Sam’s charges 17 cents for a 4×6 print and 13 cents if you’re willing to pick them up the next day. To get that price, choose “ready in days” instead of “ready in hours” in the console connected to the printer where you input your images from your media card or CD. Also make sure to turn off “auto enhance” at the bottom of the screen on the page where you choose the image, print size and quantity. Otherwise the colors will be off when your carefully prepared files are printed. In the example image you can see where I’ve added a single pixel line to mark where I cut the cards using a Rototrim cutter. Recently I had one of those aha moments. 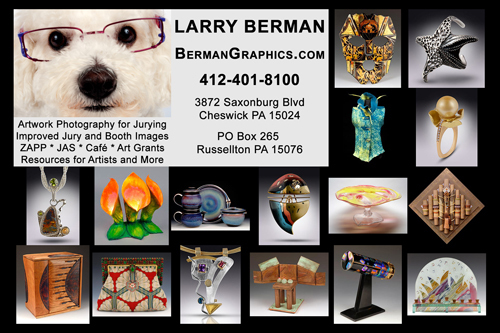 Instead of giving out business cards when I walk local art shows, why not give out full 4×6 prints with examples of my jury slide photography. At only 13 cents per print, it’s an obvious decision I wish I’d though of sooner. In actuality, the creation of the 4×6 print is the same as creating a 4×6 postcard. The only difference is that there’s nothing printed on the back and they can’t be mailed. But for artists who give out postcards instead of business cards, it’s a good move. 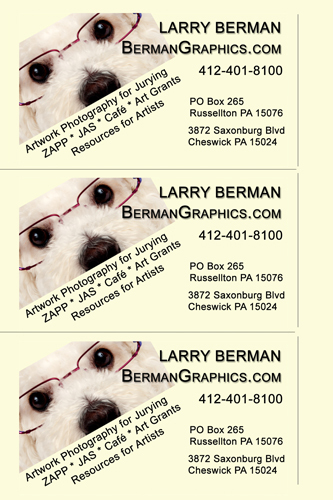 The color is better, prices are cheaper and you’re not locked into the quantity that postcard companies require. That 13 cent price can apply to a single print or any quantity. You can prepare multiple different files, each showcasing a different piece or multiple pieces of artwork. Afraid of running out of business cards? Carry your 4×6 files on a digital camera memory card and stop off at a Sam’s, Costco or Walmart on the way to a show and have new card printed within an hour. That’s the size you create in the New menu. Then add a grid to make it easier to align the elements (pictures and text) on the card. 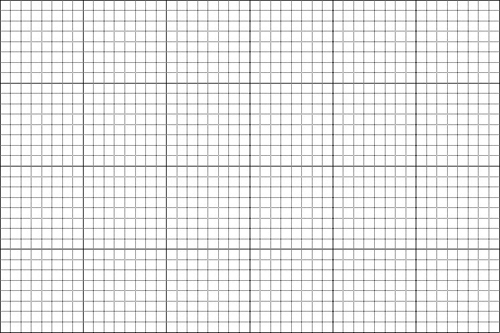 I specify a grid of one every inch with eight subdivisions. In Photoshop the grid is available in the Preferences menu. The grid you see on screen after turning it on doesn’t print. It’s only visible on the file while you are working on it. You can also choose a color for the grid so it stands out against the background and elements you’re adding to the card. Like the bleed and trim area on a postcard, your 4×6 print will also have an area at the edges that may not show up on the final print. The printers at the big box stores do not print with 100% accuracy at the edges depending on how the roll paper moves through the machine. After completing my 4×6 layout, I save it as a PSD so all the layers are editable afterwards. Then I add a 35 pixel canvas (border) on each of the four sides outside of the 4×6 area. That changes the overall pixel dimensions from 1200×1800 to 1270×1870. Then I reduce the size back to 1200 pixels on the short side making the longer side 1767. Then add canvas of the same color previously added to make the longer side 1800 pixels. There will be a slightly uneven border but the proportion of 4×6 will be maintained. Convert to the sRGB color space and save as a maximum quality JPEG using Save As JPEG. That will maintain the 300 pixel per inch resolution for a high quality print.